The Uberscoot 1000W electric scooter is definitely one of the most appealing kick scooters available out on the market today. It’s ideal for any young teen that is above 12 years of age, and can be ridden for a travel range of around 10 miles before it will need to be charged again. Unlike many other scooters, this Uberscoot 1000W electric scooter powered by Evo only has to be charged for 4-8 hours before each ride, which is significantly less than the majority of other scooters sold today. Buying a scooter can be a big step in the development of your child, or in improving your life transport-wise. Whether the kids have been begging for a power board kick scooter since last Christmas or if you want to simply have a new way to get around, this purchase will be one to remember. Apart from having fun, the Uberscoot 1000w electric scooter can also be used as a viable source of personal transport. If your child’s bus stop is far away, or if you live on the outskirts of the neighborhood, then the scooter can be a great way to get around. Even going to the local grocery store for shopping will prove to be more fun when you can glide to the shop with the child and adult kick scooter by Evo Powerboards. No matter if you have been having trouble with keeping your child active, or if they have a birthday coming up, or if you want to gift something a bit more expensive to yourself, buying the Uberscoot 1000w will definitely be a step in the right direction. It weighs about 79lbs, has a 60 day warranty, can be folded up and overall is compact enough in size that you or/and your child will be able to take it anywhere. Holiday trips and walks to the park won’t be a nuisance anymore, and you won’t hear your child moaning about wanting to go back home! The Uberscoot definitely gives off a daredevil vibe. The bulky, technical design makes it look like it has dozens of gadgets hidden within every crevice. Luckily, this 36v scooter isn’t overcrowded with accessories. This balance between the appeal and the functionality of the evo 1000w electric scooter is what makes it such a memorable product. 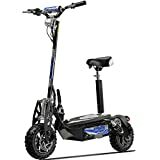 The Uberscoot 1000w electric scooter comes in the typical, black color scheme with a few blue highlights on the sides that liven up the design. The silver linings also help give this 36v scooter its bright, mechanical shine that both kids and adults adore. Since the design of the scooter is already rich, Uberscoot made sure to make the color scheme simple and mild. All of these design choices were made with great judgement calls, and that’s one of the reasons as to why this scooter is so popular among both kids and adults. The deck of the UberScoot evo is bulky and is one of the sturdiest decks we’ve ever seen. It has the perfect amount of leg room for both riders who are sitting down, and standing up. If you leave the seat attached, you can easily fit both legs onto the deck without feeling cramped. If you decide to remove the seat for the duration of the ride, you will have even more room to maneuver across the whole deck. Either way, you will be able to keep a good and sturdy balance with this scooter, no matter where you decide to ride. Overall, the deck is wide, but it also contains all the wiring and and batteries that are vital to the functionality of this power board scooter. That’s why it’s important to be careful if you want to be more aggressive with your riding. The general dimensions of this 1000w scooter are about 44” in length and 42” in height. These measurements make the ideal, almost square, size of the eve electric scooter perfect for folding up and carrying around. If you need to get on the school bus, or take another form of personal transport, then taking your electric scooter by evo with you shouldn’t be a nuisance. Since Uberscoot knows that most kids and adults will use this electric scooter to get around, then making it portable and easy to carry is vital. Thanks to its relatively lightweight build quality (the scooter by Evo Boards weighs around 79lbs), it’s comfortable to carry, wherever you go. Even though this power board scooter can be used by any child above 12 yrs of age, it’s important to keep to the weight capacity of the Uberscoot 1000w electric scooter, which is 265lbs. Since this is a relatively wide weight range, this 36v scooter can be used by both adults and kids alike, as long as they keep within the weight capacity. That’s one of the reasons that Uberscoot made their scooter so versatile; since both adults and kids often have the need to use such 1000w Uberscoot electric scooters as a form of personal transport. No matter if you want to use the Ueberscoot to glide and ride around the park or to get to school or work, it’s the ideal compact scooter to have by your side. Both of the pneumatic street tires on the front and back of the Uberscoot have about 10 inches, and make for the ideal, stable ride that everyone yearns for. Going over bumps and pavement crevices won’t be painful, and even going over marble roads should prove to be a smooth ride. Gliding around town and neighborhood roads should be a breeze, no matter if you are safe riding on gravel, uphill or downhill roads. Many customers also report that the Uberscoot is one of the most stable scooters that they have had the chance to ride, and is great value for money. Also, even though the Uberscoot 1000w electric isn’t directly designed for off-road use, it does very well on rough terrain. This is mainly thanks to it’s powerful 1000W motor, and the three 12V batteries, in its 36 volt system. The Uberscoot 1000w electric scooter is stated to be able to go as fast as 20 miles per hour. However, most customers agree that it can go up to 27 if you are a lightweight person and are safe riding on a straight road.It can last for about 10 miles on a single charge, and that’s one of the reasons many people choose to buy this power board scooter in particular. The 36V batteries can also be upgraded to 36V lithium batteries, that have a longer life and can take you to go at top speeds of up to 30mph. It’s important to note that these top speeds should only be ridden by mature teens or adults, not kids under 12 years old. Most electric 1000w scooters need to be charged for up to 12 hrs or more to be able to function properly. Uberscoot knows how much of a nuisance that can. Both enthusiastic kids and adults don’t want to wait 12 or more hours to use their scooter after each use. It can get very tiring, and can cost you a lot in electricity bills, too. After all, charging a 36V battery scooter cannot be cheap in the long run. However, thanks to Uberscoot developing their 36v scooter in a particular and efficient way, they designed it so that it only needs to be charged 4-8 hrs after each use. The small drawback of this, however, is that you need to keep a close eye on the green light and make note when it will stop charging. It’s important to not let the Uberscoot 1000w electric scooter to charge more than 8 hrs, since that can overload and damage the battery life. Regardless, before buying the Uber scoot 1000w, you should take into consideration that it will definitely make some change to your electricity bills. Whether it will be minor or major changes will depend entirely on how often you use the scooter by Evo Boards, and how your electricity plan looks like. 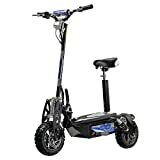 The Uber Scoot 1000w electric is ideal for anyone that wants to have some fun or needs to transport themselves around their neighborhood and/or town. This electric scooter is ideal for kids above 12 years of age, which also means that this is an ideal scooter for adults. The only thing you should pay attention to is that you shouldn’t exceed the 265lbs weight capacity. The Uberscoot 1000w electric scooter is a powerful electric kick scooter that will take you from point A to point B without any trouble. It’s stable, reliable, and can go at extremely fast rates. We like it thanks to its versatility, stability and overall attractive appeal. You can also customize the battery to have the electric kick scooter to go faster, which is a great addition for those who like to tinker with their gear. If you are interested in looking at other transport-options, then we can suggest taking a look at the Super 36V Turbo. The Super Turbo looks much like the Scooter by Evo Boards, however it has a slightly more outgoing design and a different color scheme. It can carry anyone that weighs up to 250lbs, and is ideal for uphill and downhill rides. If you find yourself around a terrain surrounded by roads located on hills and valleys, then purchasing the Super 36V turbo is the best way to go about getting yourself around that kind neighborhood. Not only that, but Super Cycles & Scooters is a reliable, decade old child and adult scooter company that has committed all their time to making quality products.